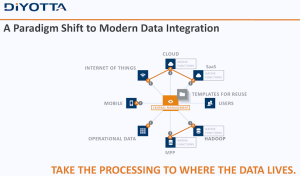 I’m still catching up and reviewed a video of last month’s Diyotta presentation to the BBBT. The company is another young, founded in 2011, data integration company working to take advantage of current technologies to provide not just better data integration but also better change management of modern data infrastructures. In many ways, they’re similar to another company, WhereScape, which I discussed last year. Both are young and small, while the market is large and the need is great. The presentation was given by Sanjay Vyas, CEO, and John Santaferraro, CMO. The introduction by Sanjay was one of the best from a small company founder that I’ve seen in a long time. He gave a brief overview of the company, its size, it’s global structure (with HQ in Charlotte, NC, and two offshore development centers). Then he went straight to what most small companies leave for last: He presented a case study. My biggest B2B marketing point is that you need to let the market know you understand it. Far too many technical founders spend their time talking about the technology they built to solve a business problem, not the business problem that was addressed by technology. Mr. Vyas went to the heart of the matter. He showed the pain in a company, the solution and, most importantly, the benefits. That is what succeeds in business. It also wasn’t an anonymous reference, it was Scotiabank, a leading Canadian bank with a global presence. When a company that large gives a named reference to a startup as small as is Diyotta, you know the firm is happy. John Santaferraro then took over for a bit with mostly positive impact. While he began by claiming a young product was mature because it’s version 3.5, no four year old firm still working on angel investments has a fully mature product. From the case study and what was demo’d later, it’s a great product but it’s clear it’s still early and needs work. There’s no need to oversell. Hybrid data integration including cloud and on-premises (though John was another marketing speaker who didn’t want to use the “s” at the end). While the other two are important, I think it’s the middle one that’s the sweet spot. They focus on metadata to abstract business knowledge of sources and targets. While many IT organizations are experimenting with Hadoop and big data, getting a better understanding and improved control over the entire EDW and data infrastructure as big data is added and new mainline techniques arrive is where a lot more immediate pain exists. Another marketing miss that could have incorporated that key point was when Mr. Santaferrero said that the old ETL methods no longer work because “having a server in the middle of it … doesn’t exist anymore.” The very next slide was as follows. Diyotta still seems to have a server in the middle, managing the communications between sources and targets through metadata abstraction. The little “A’s” in the data extremities are agents Diyotta uses to preprocess requests locally to optimize what can be optimizes natively, but they’re still managed by a central system. The message would be more powerful by explaining that the central server is mediating between sources and targets, using metadata, machine learning and other modern tools, to appropriately allocate processing at source, in the engine or in the target in the most optimal way. While there’s power in the agents, that technology has been used in other aspects of software with mixed results. One concern is that it means a high need for very close partnerships with the systems in which the agents reside. While nobody attending the live presentation asked about that, it’s a risk. The reason Sanjay and John kept talking about Netezza, Oracle and Teradata is because those are the firms whose products Diyotta has created agents. Yes, open systems such as Hadoop and Spark are also covered, but agents do limit a small company’s ability to address a variety of enterprises. The company is still small, so as long as they focus on firms with similar setups to Scotiabank, they have time to grow, to add more agents and widen their access to sources; but it’s something that should be watched. On the pricing front, they use pricing purely based on the hub. There’s no per user or per connector pricing. As someone who worked for companies that used pricing that involved connectors, I say bravo! As Mr. Vyas pointed out, their advantage is how they manage sources and targets, not which ones you want them to access. While connecting is necessary, it’s not the value add. The pricing simplifies things and can save money compared with many more complex pricing schemes that charge for parts. The final business point concerns compliance. An analyst in the room (Sorry, I didn’t catch the name) asked about Sarbanes-Oxley. The answer was that they don’t yet directly address compliance but their metadata will make it easier. For a company that focuses on metadata and whose main reference site is a major financial institution, it would serve their business to add something to explicitly address compliance. Diyotta is a young company addressing how enterprises can leverage big data as target and source alongside the existing infrastructure through better metadata management and data access. They are young and have many of the plusses and minuses that involves. They have some great technology but it’s early and they’re still trying to figure out how to address what market. The one major advantage they have, given what I’ve seen in only a two hour presentation, is Sanjay Vyas. Don’t judge a startup on where they are now or where you think they need to be. Judge them on whether or not management seems capable of getting from point A to point B. Listening to Mr. Vyas, I heard a founder who understands both business and technology and will drive them in the direction they need to go. This entry was posted in big data, Enterprise Software, Marketing and tagged bbbt, big data, data management, diyotta, diyotta software, hadoop, spark, teich communications on September 10, 2015 by David Teich. IBM, you BM, we all BM for … Spark! A recent presentation by IBM at the BBBT was interesting. As usual, it was more interesting to me for the business information than the details. As unusual, they did a great job in a balanced presentation covering both. While many presentations lean too heavily in one direction or the other, this one covered both sides very well. The main presenter was Harriet Fryman, VP of Marketing, IBM Analytics Platform. Adding information during the presentation were Steven Sit, Director of Product Management, Open Source Based Analytics Systems, and Steve Beier, Program Director, Spark Technology Center. The focus of the talk was IBM’s commitment to Apache Spark. Before diving deep into the support, Ms. Fryman began by talking about business’ evolving data needs. Her key point is that “we all do data hording,” that modern technologies are allowing us to horde far more data than ever before, and that better ways are needed to get value out of the data. Applying analytics in more parts of business. 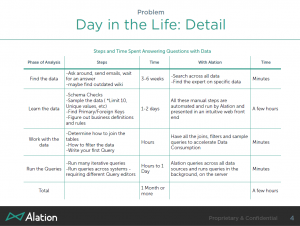 Understand the time value of data. The growth of machine learning and cognitive systems. The second two overlap, as the ability to analyze large volumes of data in near real-time means a need to have systems do more analysis. The following slide also added to IBM’s picture of the changing focus on higher level information and analytics. The presentation did go off on a tangent as some analysts overthought the differences in the different IBM groups for analytics and for Watson. Harriet showed great patience in saying they overlap, different people start with different things and internal organizational structures don’t impact IBM’s ability to leverage both. The focus then turned back to Spark, which IBM sees as the unifying layer for data access. One key issue related to that is the Spark v Hadoop debate. Some people seem to think that Spark will replace Hadoop, but the IBM team expressed clear disagreement. Spark is access while Hadoop is one data structure. While Hadoop can allow for direct batch processing of large jobs, using Spark on top of Hadoop allows much more real time processing of the information that Hadoop appropriately contains. One thing on the slide that wasn’t mentioned but links up with messages from other firms, messages which I’ve supported, is that one key component, in the upper left hand corner of the slide, is Spark SQL. Early Hadoop players were talking about no-SQL, but people are continuing to accept that SQL isn’t going anywhere. Well, most people. 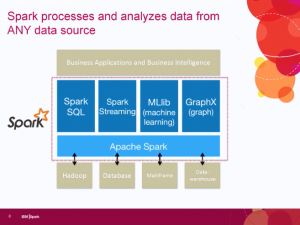 At least fifteen minutes after this slide was presented, an attending analyst asked about why IBM’s description of Spark seemed to be similar to the way they talk about SQL. All three IBM’ers quickly popped up with the clear fact that the same concepts drive both. While the team continued to discuss Spark as a key business imitative, Claudia Imhoff asked a key question on the minds of anyone who noticed huge IBM going to open source: What’s in it for them? Harriet Fryman responded that IBM sees the future of Spark and to leverage it properly for its own business it needed to be part of the community, hence moving SystemML to open source. Spark may be open source, but the breadth and skills of IBM mean that value added applications can be layered on top of it to continue the revenue stream. Much more detail was then stated and demonstrated about Spark, but I’ll leave that to the more technical analysts and vendor who can help you. One final note put here so it didn’t distract from the main message or clutter the summary. Harriet, please. You’re a great expert and a top marketing person. However, when you say “premise” instead of “premises,” as you did multiple times, it distracts greatly from making a clear marking message about the cloud. IBM sees the future of data access to be Apache Spark. Its analytics group is making strides to open not only align with open source, but to be an involved player to help the evolution of Spark’s data access. To ignore IBM’s combined strength in understanding enterprise business, software and services is to not understand that it is a major player in some of the key big data changes happening today. The IBM Spark initiative isn’t a marketing ploy, it’s real. The presentation showed a combination of clear business thought and strategy alongside strong technical implementation. This entry was posted in big data, Business Intelligence, Enterprise Software, Marketing and tagged apache spark, bbbt, big data, business intelligence, hadoop, ibm, ibm analytics, teich communications on September 9, 2015 by David Teich. Last Friday’s presenters to the BBBT were Satyen Sangani, CEO, and Anand Aidasani, Customer Development Lead, from Alation. The company is a two and a half year old startup that released its first product in March – a tool to help analysts better understand the metadata surrounding their corporate data. One of the early and powerful statements by Mr. Sangini was that big data is more than volume and had a lot to do with the variety of data. I’ve talked about that before, so it is good to see more vendors openly admitting the fact. One caveat: They quickly JDBC, and move on. There was no mention about breadth of data accessed by their existing clients or any performance issues. When you talk with them, make sure to ask specific questions about your data sources. You won’t be surprised when I now turn to their marketing message. They present a top level message of making it easier for business knowledge workers to get the information they need, but the product is all about the data analyst. While helping the later group does indirectly help the former, the message needs to be more focused on the analysts but with a split message about how they can both do their jobs faster and help their business clients respond more quickly with more accurate information. They had a good ROI message for analysts, presented in the following slide. That has a lot of good content but needs to be simplified and clarified to fit into sales and marketing messages focused at IT, analysts and end users – the challenge of true enterprise positioning. Their best strategic slide was the one where they present their platform with the high level goals of the firm. Data governance. I’ve come back to it regularly, and it matters. Even a year ago, many business intelligence startups were crowing about ignoring IT and letting users do what they want. Enterprise customers have pushed back and the smart folks have listened. Modern BI needs to be about getter better data to business people faster while still ensuring that the information matches company, contractual and regulatory governance issues. That Alation lists governance first shows a strong understanding of market needs. Alation’s collaboration is early and, again, focused primarily on analysts and other technical people. There are some great features to see SQL being used throughout the organization and analytics about the usage. What can be shared to business users who aren’t gurus needs to be improved, but it’s a young company and the collaboration they have is a great start in helping understand data as a team to speed development and improve governance. Their platform doesn’t directly optimize queries, but there are some nice analytics available. Just as importantly, when the software identifies either an inefficient query or one that might be slow do to a large result set, a warning can be displayed to the analyst before the query is run. It’s another first generation feature that’s nice but could use more power and breadth combined, from what I could see in a short demo, a better user interface. The biggest challenge for Alation is not technology, it’s marketing. What are they? They’re not an ETL tool, a pure metadata application, or a BI product. They overlap a few areas but I’m not sure where they’d be categorized by all the analyst first that feel they must categorize everything. More importantly, if the Alation management can’t figure out how to message a clear message to the market, it’s going to significantly slow the sales cycle. My view is that they are primarily a metadata tool, but a number of BBBT members expressed dismay at the mention of metadata. The pushback was the business customers don’t understand metadata. The issue I have with that argument is that it’s an IT/analyst product and they understand metadata. For the business users who are involved in the purchase decision, Alation can certainly create content that focuses on the benefits the product brings to them, which can avoid talking about metadata, but there’s no need to avoid the word in the core content focused at their primarily technical audience. 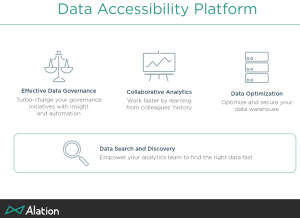 Alation seems to be a good new tool for understand where you data is coming from to improve data governance and performance. The brief time we had didn’t get me much further than that. If you’re in need of better understanding your complex information infrastructure, spend some time with them and see what they have to offer. 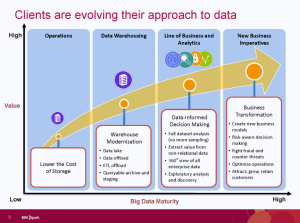 This entry was posted in big data, Business Intelligence, Enterprise Software, Marketing and tagged bbbt, big data, data management, metadata, teich communications. alataion on June 9, 2015 by David Teich. The most recent BBBT presentation was from Dell Software. Peter Evans, Sr. Integrated Solutions Development Consultant , and Steven Phillips, Product Marketing Manager – Big Data & Analytics, gave us an overview of Dell’s architecture for addressing business intelligence (BI). What they’re working to accomplish is, no surprise, ensure that Dell’s hardware is able to be present throughout the BI supply chain. For that, they’re working to be application agnostic, though they mislabel it as “no lock-in.” What they’re saying is you can change your software vendors and Dell will still be there. There’s no addressing true lock-in, the difficulty in changing one software vendor to another based on level of openness to data in systems and other costs of moving. One marketing nit that caught a number of us was Peter’s early claim that Dell is “probably the third largest software company in the world.” Right… First, as a now privately held company, we have no way to confirm that. Second, I’m not sure if he knows just how much revenue is needed to be near the top of that list. Far too many young firms are overselling BI as something that will let business “avoid IT.” That’s not only impossible, it wouldn’t make sense if it was possible. IT has a clear place in organizing infrastructure, providing consistency, helping with compliance and doing other things a central organization should do. Dell has started with IT. They’re used to dealing with IT and their solution is focused on helping IT enable business. What’s not clear is how well they can do such a thing in the new world. They’ve pieced a lot of different applications into an architecture and that would seem to require heavy IT involvement in much of what’s being provided. On the good side, that knowledge means they better understand true enterprise business needs. Unlike many vendors, Dell has regulatory and statutory compliance at the forefront, very clear in its marketechture slides. While most companies understand they have to mention compliance, it’s usually people dealing with corporate business groups such as IT and legal who understand just how critical compliance is. Neither Peter Evans nor Steven Phillips spoke clearly to the business user, the want for speed and flexibility for them. While younger companies need to move more to addressing the importance of IT, Dell needs to more strongly focus on the business customer, the ones who are often in charge of the BI and related software projects and spending. The technical piece that stuck with me the most was the discussion of Boomi Suggest. Boomi is Dells integration tool. Within it, there’s a cloud-based tool called Boomi Suggest. If users subscribe to it, the product tracks data linkages and the de-natured information is kept to help other customers more quickly map data sources and targets. Mr. Evens says that Boomi Suggest has a database that now contains more than 16 million links. The intelligence on top to that then is able to provide a 92% accuracy rate in analyzing new links. The time savings that alone suggests is a major decision driver that should not be overlooked. While the case study didn’t address enough of the end user issues of timeliness, flexibility and more, it was a very interesting case study from an inclusive standpoint. The Dell team focused on asthma case management to show the breadth of data sources, the complexity of analytics and a full process that could be generalized from the healthcare sector in order to support their full platform message. As you can see, they are doing a lot of things with a variety of information, but they’re also doing it with a variety of products. Dell’s decades of working with IT has helped it look at BI with a more complex eye that can address many of IT’s concerns. What we saw was an almost completely IT solution and message. While BI focused companies are going to have to move down and address important IT messages, Dell must go in the opposite direction. Unless the team can broaden their message to address the solution to more business teams, Dell’s expansion in the market will be severely limited because it’s the business groups that write the checks. The presentation shows a great start. However, the questions are if Dell can simplify the architecture to make it less complex, potentially by merging a number of their products, and whether or not they can learn about those folks they don’t have a history of directly understanding: The business user. If they can do that, the start will expand and Dell Software can help in the BI market. 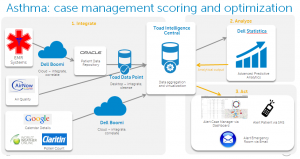 This entry was posted in big data, Business Intelligence, Enterprise Software and tagged bbbt, big data, boomi, business intelligence, dell, dell software, information technology, teich communications on May 19, 2015 by David Teich. The most recent BBBT presentation was by Looker. Lloyd Tabb, Founder & CTO, and Zach Taylor, Product Marketing Manager, showed up to display yet another young company’s interesting technology. Looker’s technology is an application server that sits above relational databases to provide faster, more complex queries. They’ve developed their own language, LookML to help with that. That’s no surprise, as Lloyd is a self-described language guy. It’s also no surprise that the demos, driven by both Lloyd and Zach, were very coding heavy. Part of the reason that very technical focus exists is, as Mr. Tabb stated, that Looker thinks there are two groups of users: Coders who build models and business managers who use the information. There is no room in that model for the business analyst, the person who understands who to communicate a complex business need to the coders and how to help the coders deliver something that is accessible to and understandable by the information consumer. How the bifurcation was played out in the demonstration was through an almost exclusive focus on code, code and more code, with a brief display of some visualization technology. The former was very good while the later wasn’t bad but, to fit with their mainly technology focus, had complex visualizations without good enough legends – they were visualizations that would be understood by technical people but need to be better explained for the business audience they claim to address. As an early stage company, that’s ok. The business intelligence (BI) market is still young and very fragmented. You can get different groups in large companies using different BI tools. While Looker talks about 300 customers, as with most companies of their size it could only be those small groups. If they’re going to grow past those groups, they need to focus a bit more in how to better bridge technology and business. They also have a good start in attracting the larger market because they support both cloud and on-premises systems. The former market is growing while the later isn’t going away. Providing the ability for their server to run either place will address the needs of companies on either side of the divide. One key to their system is they don’t move data. It stays resident on the source systems. Those could be operational systems, data warehouses, an ODS or whatever. What they must have is SQL. When asked about Hadoop and other schema-on-write systems, the Looker team stated they are an RDMS based application but they’ll work on anything with SQL access. I have no problem with the technology, but they need to be very clear about the split. SQL came from the relational world, but as they pointed out in an aside, it isn’t limited to that. They should drop the RDMS message and focus on SQL. As Lloyd Tabb said, “SQL is the right abstraction.” What I don’t know if he understands, being focused on technology and having those biases, is it isn’t the right abstraction because of some technical advantage but because it’s the major player. McDonalds isn’t the best burger because it has the most stores. SQL might not be the best access method, but it’s the one business knows and so it’s the one the newer database companies and structures can’t ignore. Last year, the BBBT heard from multiple companies including Actian and EXASOL, companies focused on providing SQL access to Hadoop. That’s as important as what Looker is doing. The company that manages to do both well with jump ahead of the pack. Looker is a good, young company with some technical advantages that can greatly improve the performance of SQL queries to business databases and provides a basic BI front end to display the results. I’m not sure they have the resources to focus on both, and I think the former have the clearest advantage in the marketplace. Unless they have more funding and a strong management team that can begin to better understand the business side of the market, they will have problems addressing the visualization side of BI. They need to keep improving their engine, spread it to access more data sources, and partner with visualization companies to provide the front end. 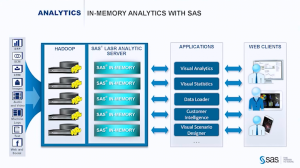 This entry was posted in Business Intelligence, Enterprise Software and tagged bbbt, business intelligence, cloud computing, data warehouse, enterprise software, teich communications on May 5, 2015 by David Teich. Last Friday’s BBBT presentation by an ensemble cast from Rocket Software was interesting, in both good and bad meanings of that word. They have some very interesting products that address the business intelligence (BI) industry, but they also have some confusion. Bob Potter, SVP and GM, Business Intelligence, opened the presentation by pointing out that Rocket has more than $300 million (USD) in annual revenue yet many tech folks have never heard of them. One reason for the combination is they’ve done a good job in balancing both build and buy decisions to provide niche software solutions in a variety of places and on a number of platforms. Another is a strong mainframe focus. The third is that they don’t seem to know how to market. Let’s focus on just the two products presented to demonstrate all of these. Most of the presentation was focused on Rocket Data Virtualization (DV). There are two issues it addressed. The first is accessing data from multiple sources without the need to first build a data warehouse. DV is the foundation of what was first thought of as the federated or virtual data warehouse. It’s useful. Gregg Willhoit, Managing Director, Research & Development, gave a good overview of DV and then delved into the product. Rocket Data Virtualization is a mainframe resident product to enhance data virtualization, running on IBM z. While this has the clear market limit of requiring a company large enough to have a mainframe, it’s important to consider this. There are still vast amounts of applications running on mainframes and it’s not just old line Cobol. Mainframes run Unix, Linux and other OS partitions to leverage multiple applications. An important point was brought up when Gregg was asked about access to the product. He said that Rocket is working with other BI industry partners, folks who provide visualization, so that they can access the virtualized data. However, if you want to know more about the product, good luck. As I’ll discuss in more detail later, if you go to their site you’ll find all marcom fluff. It’s good marcom fluff, but driving deeper requires downloads or contacting sales people. That doesn’t help a complex enterprise sale. The presentation was turned over to Doug Anderson, Solutions Engineer, for a look at their unreleased product Rocket Discover. It’s close, in beta, but it’s not yet out. As the name implies, Rocket Discover is their version of a visualization tool. It’s a very good, basic tool that will compete well in the market except for two key things. The first is that they claimed Rocket is aiming at “high level executives” and that’s not the market. This is a product for business analysts. Second, while it has the full set of features that modern analysts will want, it’s based on a look and feel that’s at least a decade old. On the very positive side, they do have a messaging feature built in to help with collaboration. It needs to grow, but this is a brand new product and they have seen where the market is going and are addressing it. Another positive sign is this isn’t a mainframe product. It runs on servers (unspecified) and they’re starting with both on-premises and cloud options. This is a product that clearly is aimed at a wider market than they historically have addressed. While they have understood the basics of the technology, the question is whether or not they understand the market. One teaser that shows that they probably don’t was brought up by another analyst who pointed out that Doug and others were often referring to the product as just Discover. Oracle has had a Discover product for many years. While Rocket might not have seen it on the mainframe, there will be some marketing issues if the company doesn’t always refer to the product as Rocket Discover, and they might have problems anyway. Their legal and marketing teams need to investigate quickly – before release. The product presentation and a Q&A session that covered more issues with even more folks from Rocket taking part, show the problems Rocket will have. As pointed out, the main reasons that so many people have never heard of Rocket is it sells very technical solutions to enterprise IT. Those are direct sales to a very technical audience. However, enterprise software is more than enterprise IT. Enterprise software such as ERP, CRM, SFA and, yes, BI, address business issues with technology. That means there will be a complex sales cycle involving people from different organizations, a cycle that’s longer and more involved than a pure sale to IT. I’m not sure that Rocket has yet internalized that knowledge. As mentioned above, their website is very fluffy, as if the thought is that you put something pretty (though I argue against the current fad of multiple bands requiring scrolling, it’s neither pretty nor easy to use) with mission and message only, then you quickly get your techies talking directly to their techies, is the way you sell. Perhaps when talking with techies only, but not in an enterprise sale. That’s my biggest gripe about the software industry not understanding the need for product marketing. You must be able to build a bridge to both technical and business users with a mix of collateral and content that span the gap. I’m not seeing that with Rocket. In addition, consider the two products and the market. DV is very useful and there are multiple companies trying to provide the capability. While Rocket’s knowledge of and access to mainframe data is a clear advantage, the fact the product only runs on mainframes is a very limiting competitive message. I understand they have tied their horses very closely to IBM, and it makes sense to have a z option, but to not provide multiple platforms or a way for non-mainframe customers to use their more general concepts and technologies will retard growth. If their plan is to provide what they know first then spread to other platforms, it’s a good strategy; but that wasn’t discussed. Both products, though, have the same marketing issue. Rocket needs to show that it understands it is changing from selling almost exclusively to enterprise IT and needs to create a more integrated product marketing message to help sell to the enterprise. There’s also the issue of how to balance the messages for the two products. For Rocket Data Virtualization to succeed, it really does need to work with the key BI vendors. Those companies will wonder about Rocket’s dedication to them while Rocket Discover exists. Providing a close relationship with those vendors will retard Rocket Discover’s growth. Pushing both products will be walking a tightrope and I haven’t seen any messaging that shows they know it. Rocket is a company that is very strong on technology that helps enterprise IT. Both Rocket Data Virtualization and Rocket Discover have the basics in place for strong products. The piece missing is an understanding of how to message the wider enterprise market and even the mid- and small-size company markets. Rocket Data Virtualization is the product that has the most immediate impact with the clear differentiation of very powerful access to mainframe data and the product I think should make the more rapid entrant into its space. The question is whether or not they can spread platform support past the mainframe faster than other companies will realize the importance of mainframe data. In the short term, however, they have a great message if they can figure out how to push it. Rocket Discover is a very good start for a visualization tool, but primarily on the technology side. They need to figure out how to jump forward in GUI and into predictive and other analytics to be truly successful going forward, but the market is young and they have time. The biggest issue is if Rocket will learn how to market and sell in broader enterprise and SMB sales, both to better address the multiple buyers in the sales cycle and to better communicate how both products interact in a complex market place. Rocket is worth the look, they just need to learn how to provide the look to the full market. This entry was posted in Business Intelligence, Enterprise Software, Marketing and tagged bbbt, business intelligence, data virtualization, ibm, rocket software, teich communications on April 20, 2015 by David Teich. Today the BBBT held a special session. While most presentations are by companies with full products, existing sales and who typically have been around for a few years, today we had the pleasure of listening to Sherry Brown, President of AptiMap. This is a pure startup company, still tiny. She was looking for our always vocal analyst community’s opinions on her initial aim and direction. Not to surprise anyone who knows the BBBT, we gave that at full bore. Ms. Brown’s goal is to provide a far easier way of mapping fields between source and target datasets for creating data warehouses and other data stores. It’s a great start and she has some initial features that will help. I’ll be blunt: I’m intentionally not going to say a lot. As mentioned, they are a very early startup and the software isn’t full fledged. That means any mention of what they have and don’t have could be inaccurate by next week. That’s not a bad thing, it’s what happens at that phase. I will mention that the product is cloud based from the start. Might especially be good in the hands of consultants going into those types of companies. One final key, one that needs to be a full paragraph rather than a bullet and one that many technical startups don’t get while building their products based on user needs, is that users aren’t the only decision makers in the product. As mentioned, this is a cloud product and AptiMap will be expecting recurring revenue from monthly or annual fees. The business analyst is often not the person who approves those types of costs. The firm also needs to focus messages on the buyers, whether IT, line or consulting management, to build messages that help them understand the business benefit of providing the tool to their people. Understanding your market matters. It will help the firm not only focus product, but also narrow down the marketing message and image to aim at the correct audience. Too often, founders get a great technical idea and focus on a couple of users to fill out product features and then try to find a market. BI is moving too fast for that, the vision needs to be much more clearly set out much earlier than was needed in software companies twenty years ago. Finally, I mentioned the cloud model but should also mention AptiMap is offering a 30-day free trial. AptiMap has an initial product that can help people more rapidly and accurately create mappings between data sources and targets. It’s cloud based for easy access. It is, however, very early in the product and company life cycle. I would suggest it primarily to analysts in mid-sized organizations or consultants who work with SMBs and want some quick hit functionality add to map data sources for the creation of data warehouses, ODS’s and other relationally oriented data repositories. If you want to experiment inexpensively with an early product that could help, contact them. This entry was posted in Business Intelligence, Cloud, Marketing and tagged aptimap, bbbt, data, data mapping, data warehouse, teich communications on March 18, 2015 by David Teich.